In life, having your dreams come true is awe-inspiring. 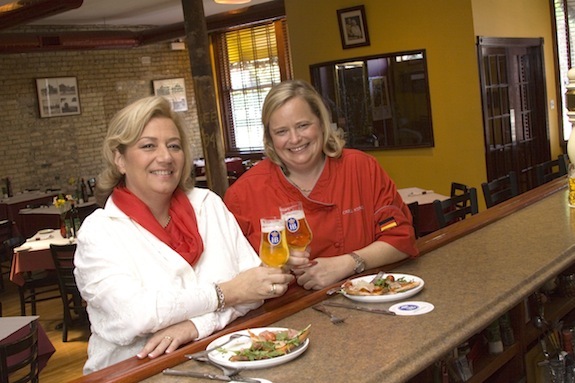 For us, (sisters) Diana and Carol Himmel, our dream started in our mother’s north-side Chicago kitchen dishing up scrumptious, homemade meals. For the past five years, we have been blessed to bring you Pizza D.O.C. We’ve called ourselves an Italian restaurant with a German flair – and we of course have been the German flair. Now, we’re settling into our own, creating new from scratch dishes with a personal touch. Welcome to Himmel’s. When you walk into our restaurant, we want you to feel like you are at home. Our amazing wood-burning oven is the first of its kind in the city of Chicago. The oven is straight from Rome and has been making authentic pizzas and breads for more than 15 years. The flavor profile this culinary vessel brings to pizza is so spectacular; we just couldn’t let our other foods get jealous. So we started to experiment and found that our specials have been such a hit, we wanted to make them a more permanent fixture. We hope you will try our succulent half-roasted chicken, or perhaps our hand-scored (tender on the inside and crispy on the outside) pork shank. Don’t miss our thick cut bone-in ribeye, seasoned to perfection. All of these dishes finished in our one of a kind oven. Our wood-burning oven will still be churning out our famous Roman style pizzas made with the freshest ingredients, handcrafted and baked in a 700-degree oak burning brick oven. And our chefs will be crafting fresh made specialty pastas and salads for your enjoyment. Sit back, relax, enjoy your meal and welcome to heaven on earth…Himmel’s.